"Alexa, open Aurora Monkey . . ."
Free Real-time, On-demand Aurora Borealis Voice Forecasts and Data from Alexa. Even provides a lesson when it detects, you're a rookie aurora hunter. 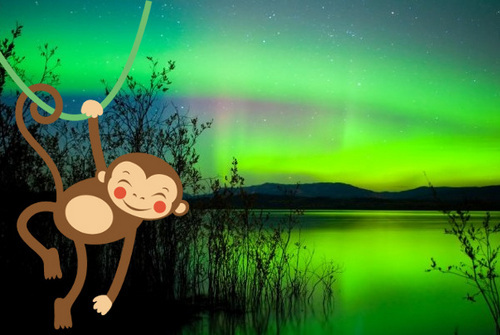 From the people who brought you the internet's leading Aurora Borealis Forecast site (Soft Serve News), here's Aurora Monkey -- the real-time aurora borealis voice forecasts from Alexa. If you have the amazon Alexa app on your phone or if you have the Amazon Echo, you can now get real-time, voice aurora borealis forecasts and info. Just say, "Alexa, open aurora monkey" (pronounce this carefully), and the system will teach you everything thing you need to know. This skill is available in every country in which you can talk to Alexa in English. If you cannot get the skill to work, you might have to enable the skill on the Alexa app (although technically this should not be necessary). If you know absolutely nothing about hunting the Aurora, that will be detected by your answers to a couple quick initial questions and you'll get a short lesson on using the Aurora Monkey data to help catch an aurora. Also, if you don't understand what a particular response means, just say "help," and you'll get a detailed explanation. After you've played around with it a few times, the next time you use it, just interrupt its intro and say "Alexa, put me in expert mode." This will avoid all the questions designed to help new users. But the first few times, just say "Alexa, open aurora monkey" (again, pronounce carefully), until you get familiar with it. 1) What's the short-term aurora forecast? 2) What are the recent BZ averages? 3) What's the hemispheric power? 4) Is there a solar storm watch? 5) What's the solar wind speed? 6) Can I get Aurora Alerts? 8) Can I see the Aurora? 9) What can I ask you? 10) Put me in expert mode. 11) Help, Repeat and Leave (each does what you think). 12) Who created that awesome monkey brain of yours? This Alexa skill turned out pretty well. It's good for rookie aurora hunters because of all the training info. At the beginning it's best to let the system lead you around by the hand, until you get used to it. But after that, you should take control to get your info quickly. The key to that is to get into expert mode quickly, otherwise you'll get pecked to death with newbie "training" questions and prompts. You can always just interrupt by saying "Alexa, put me in expert mode." But the absolute best way to get away from the newbie questions is to start the skill like this, "Alexa, ask Aurora Monkey to put me in expert mode." Say that when you first want to contact Aurora Monkey. Aurora Monkey: Ok, you're in expert mode. You: What's the short term forecast? You: What's the BZ list? You: What's the hemispheric power? Aurora Monkey: Ok, bye eek eek. Now, you'll note that once you invoke the Aurora Monkey skill, you don't have to use the word Alexa again (unless you want to interrupt the skill). Another nice feature is that you don't have to ever ask if there's a solar storm watch. If there is one, at the end of the short term forecast, it will say there is a solar storm watch and ask if you want to hear the details. You: Alexa, ask Aurora Monkey what the hemispheric power is. Aurora Monkey: In 38 minutes the ovation hemispheric power will be 38 gigawatts. Are you somewhat new to Aurora Monkey? Easy peasy. Note, you did not have to answer Aurora Monkey's question (Are you somewhat new to Aurora Monkey?). You could have asked it another question, gone into expert mode, or in this case you just said "leave" to end the session. Also please remember, if you cannot get the skill to connect, try to pronounce things more slowly and carefully -- and you might have to enable the skill on the Alexa app (although Amazon says you technically shouldn't have to). Finally, if you like this new Alexa skill, I hope you give it a good review here or on your Alexa app. In any case, I hope you get a chance to see an awesome Aurora soon!